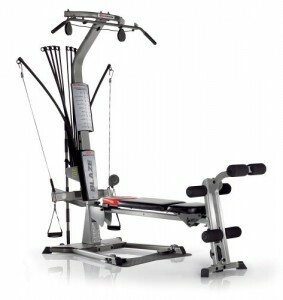 3 What are other reviews saying about the Bowflex Blaze? At a competitive, sub $1000 price point, the Bowflex Blaze Home Gym reviewed here offers a full body workout from its 60+ exercises. The weight is delivered through the Bowflex Power Rod system, and like the more expensive Xtreme 2 SE its weight can be upgraded from 210 pounds to 410 pounds. The Power Rod system is at the heart of all the Bowflex Home Gyms. It consists of a set of metal rods, connected to pulleys which are bent and return to their original position during workout. Bowflex claim that this provides a workout as good as a gym! There are some advantages to this system, for example there is no need for big heavy lumps of iron to be cast and shipped. This keeps the cost down. In addition the bars flex silently so there is no loud noises which generate from weight stacks being dropped. All the power rods are strong and will last the lifetime of the gym, Bowflex even offer five year warranties on their Power Rods. The quality of the Powerrods is amazing. Given the forces they are under they will repeatedly bend and reshape each time coming back to their original position and with the same power even after years of use. As the power rods are actually quite light, with their resistance coming from being bent out of shape, there are no heavy weights that can cause injury. It is possible to do heavy weight training without the need for a spotter. 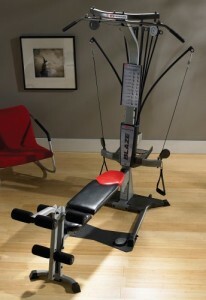 With over 60 exercises on offer with the Bowflex Blaze Home Gym every muscle group can be worked out. As the gym is in your own home it is incredibly versatile, no more queuing for equipment to come free, and you can access it 24/7. The exercises include: 9 back, 16 arm, 14 shoulder, 13 leg, 8 chest and 5 ab exercises. This covers all the major muscle groups, and allows for a good deal of individual targeting. What are other reviews saying about the Bowflex Blaze? This is an incredibly popular home gym, and has received a lot of praise. Currently it has a rating of 4.6 out of 5 stars on Amazon. Most users like the full gym feel in their own home. The system is perfect for definition training, with a quick change between exercises it is possible to complete a full workout very quickly. All the 60 exercises are “real” and add to the workout, they are not just fillers so you can do a full workout on arms or shoulders. Some issues, the machine cannot take users over 6’4″ tall, nor is it suitable for anyone over 300lb. With the “out of the box” weight of 210lb you may want to consider upgrading the weights to 310lb. This is a well made home gym, with great flexibility on its exercise. The power rod system, while not perfect is a great alternative to free weights. They give a nice feel and deliver good resistance through the full range of the workout. While not the cheapest home gym on the market, the Blaze hits a good balance between price and quality. You can tell its very well made, much higher grade materials than cheaper models, and the generous warranty backs this up. If you want to feel good and look great, then the Bowflex Blaze is a great choice. 210 lbs. of Power Rod® resistance, upgradable to 310 lbs. or 410 lbs. An excellent upper body workout machine, for not a lot of money.